The structure of the two-photon absorption material (left) and the variation of the convex shape depending on the irradiation time of a laser light (right). Credit: TechOn! (Phys.org)—Fujifilm is working on a new recording method for optical discs. It has developed the new method through the use of two-photon absorption in order to generate heat, and the report in TechOn! notes that this two-photon method is suited for multilayer discs. As the reaction caused by two-photon absorption can be limited to the small area of the focal point of a laser light, it is possible to increase the number of recording layers. The nuance is that Fujifilm has combined a two-photon absorption method with a "heat-mode recording" method. The latter refers to technology that makes the most of a phenomenon where a change is caused by applying a laser light with a high energy density to instantaneously increase the temperature of a minute area of a recording material. Two-photon absorption refers to the simultaneous absorption of two photons of identical or different frequencies to excite a molecule from one state to a higher energy electronic state. According to Fujifilm, the procedure can bring about a recording density of 25 Gbytes per layer, the equivalent to the recording density of a Blu-ray Disc (BD), in addition to 20 layers per side of a disc. A double-sided optical disc with a 1TB storage capacity is possible. Fujifilm foresees bringing a 1TB optical disc to market in 2015. 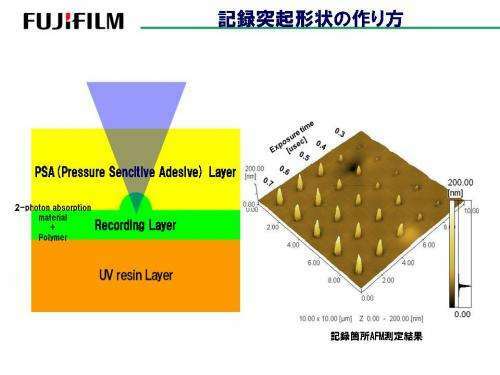 Fujifilm simplified the manufacturing process by using "web coating" to form the recording, ultraviolet curable resin and adhesive material layers and sticking them together. With BD, spin coating and sputtering are needed for each layer. "It takes 147 seconds to form a four-layer BD," the company said. "With our method, it takes only 58 seconds to form eight layers." Overall, Fujifilm said that the new disc's manufacture will be cheaper than BD discs currently available. The two-photon absorption disc has a cost as low as that of a magnetic tape. A company spokesperson said that, "We will continue the development of the disc with help from drive makers." This new recording method potentially will realize a 15-Tbyte disc. "In the future, it will be possible to realize a 15-Tbyte optical disc (25 Gbytes/layer x 3 (eight values) x 100 layers x 2 (two sides)," Fujifilm said. Fujifilm was scheduled to discuss its latest results at the International Broadcast Equipment Exhibition 2012 in Chiba Prefecture, Japan, which wound down over the weekend. This year's event was described as focusing on "the next technological innovations beyond digitalization." Please, no more optical disks!!!! END THIS ALREADY! I hate how easily they get scratched, I hate their spin up time, I hate their very existence. They are a pain and a nuisance and there are much better ways of doing storage. with 4k films requiring 3.5 terabits per 90 min movie, this could be the breakthrough to take 4k into the mainstream. while i agree we should be moving away from disks, in the short term it is a low cost solution. it will be interesting to see if the final costings match the hype. Which ways should we be moving to.? @Intensero SSD's or Solid State Drives. Like a thumb drive or cell Pyotr/tablet memory. Much, much faster because on moving parts. While physical storage is slowly becoming a thing of the past for many of us, the fact is the data still has to live somewhere. Disks like this could replace tape drives for doing backups in data centers. Because it's always a matter of cost. Optical disc material is dirt cheap compared to any other storage technology. Also the research costs is lower than with the stuff you linked to. Both of these translate into higher profits (and less monetary risks shoulc the technology not be adopted). We occasionally need reminding that companies do not care one bit (ha!) about providing the best product. They only care about which product produces the most profits. I think it would be prudent to encase these optical disks into cartridge to make them more resistant against scratches. CD is obviously cheaper than 3.5" disks, but being in a cartridge, 3.5" floppy disk is actually not anymore floppy like 5.25" and 8" ones were and is much more robust than a CD or DVD is. I also see these optical media as an alternative to tape backup, not for constant use. One thing that is not stated is how does one erase the disk or is this only write once media.